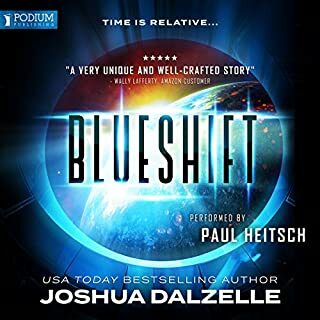 From Joshua Dalzelle, author of the best-selling Omega Force series, comes an all new vision of humanity's future. In the 25th century, humans have conquered space. The advent of faster-than-light travel has opened up hundreds of habitable planets for colonization, and humans have exploited the virtually limitless space and resources for hundreds of years with impunity. So complacent have they become with the overabundance that armed conflict is a thing of the past, and their machines of war are obsolete and decrepit. What would happen if they were suddenly threatened by a terrifying new enemy? Would humanity fold and surrender, or would they return to their evolutionary roots and meet force with force? One ship - and one captain - will soon be faced with this very choice. I was initially drawn to this book because I was looking for other Mark Boyett performances. 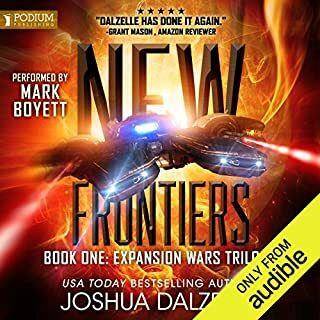 After listening to every Star Force, Undying Mercenaries, and Troy Rising audiobook with other standalone novels he performed, I feel like I've heard the full spectrum of Boyett's voices a dozen times over. Yet, somehow he still can make me believe that I'm in a completely different universe with a whole different set of characters, all of them with unique nuances. Boyett has definitely become my favorite military scifi/space opera narrator, and with Warship, he once again gives a performance that is nothing less than stellar. All of the other reviews have pretty much said all there was to be said, and I echo their words. I honestly was a bit hesitant to believe all of the reviews, as I had never seen so much glowing for the first book in a series. 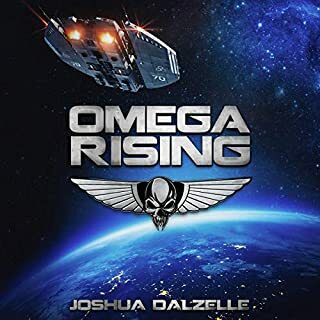 I haven't read anything from the Omega Rising series, and this was my first exposure to Joshua Dalzelle. Needless to say, I was very impressed. At least in Warship, Dalzelle's style was remarkably lucid. I had absolutely no problem following the action, even though I listened to the entirety of the story while working. Though he relied on archetypes for some of the minor characters (e.g. the underachieving and entitled non-com who turns out to be mutinous, and the stubborn-to-a-fault racist admiral), I appreciated the complexity of the main characters who all brought with them various surprises throughout the story. Captain Wolfe remains relatable while also demonstrating near-superhuman levels of courage in the face of almost certain defeat. And his XO's loyalty and resourcefulness are truly admirable. I could easily imagine myself willfully following the orders of either of these individuals if I were to serve under their command. The future science and politics are not too far-fetched, though I wonder if the implied time-frame would actually be sufficient for the degree of alleged colonization of other star systems that is presented. As a scientist, I appreciate the realistic interpretations of physics and biology. Though the skittish, unhinged, scatterbrained scientist archetype presented at the end of the book was a little irritating, especially in the face of the cool, collected, and confident engineer character that was introduced right after. However, given all of the other positive aspects in this production, I'll let it slide... this time! But, seriously, this book is definitely worth it. I really hope they stay with Boyett for the rest of the series. This was the kind of Science Fiction I really like. Military in nature, and interpersonal. It does have one of my least favorite things. The first book of a trilogy without the rest of the trilogy available and thus have to read other books until the trilogy is finished. Maybe it's because I'm a long-serving military veteran, but this story and its account of a group of so-called military personal leaves me cold. The relationships, responses and reactions of the crew are at times just plain silly, like when the hero/captain tears his rank off then shreds his shirt in response to losing his first casualty, a technician whose name he didn't know. Really? Like the captain, the characters are one-dimensional and over-wrought: the scheming mutineer, the evil admiral, or the sweet and ever helpful female XO. It takes a lot for me to give up on a book but after two-thirds I just can't be bothered to finish this one. The narrator does a good job, but the material he's working with is mostly simplistic pulp. Very disappointing. 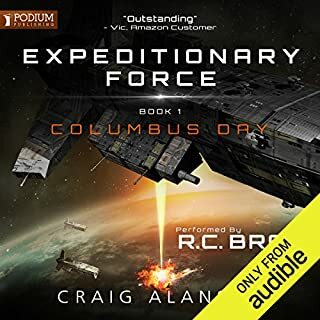 Best space war book I have ever heard. Oooooh boy! What a ride! I pretty much listened to this book in one sitting. I did try to shut it off while I made some lunch. But my mind kept itself occupied with the story, and I had it back on before I knew it. I very much enjoyed all of the characters, good and bad. And the development and evolution of the handful of main characters only helped to enhance a story that had me on the edge of my seat throughout. I came to this book after enjoying Omega Rising, and I found another story that was completely enjoyable while being completely different (except for that fact that it was in space). The narrator did a great job of bringing the characters to life and kept really good energy and pace throughout. I'd never listened to anything read by Mark Boyett, but I'm glad I heard him here. 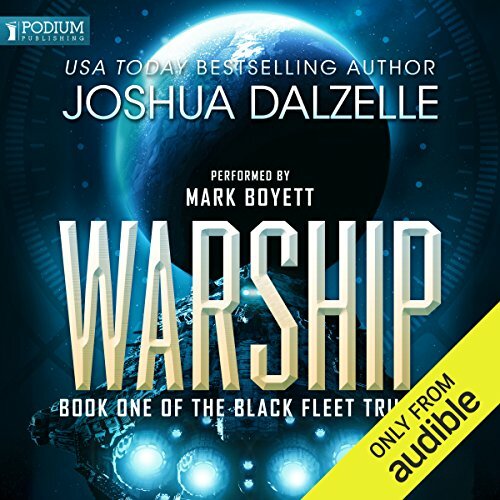 Joshua Dalzelle's Warship is the 1st installment in the Black Fleet trilogy. Set in the far future, local space has been conquered and settled. All alone and with plenty of room, humanity has become complacent towards its military / defense posture. At the same time, Earth and its natives get little respect. One old relic with its washed-up "earther" captain are sent on a final routine mission before its decomissioning. Unfortunately, routine is hardly applicable in this case as hostile aliens are encountered. Believing the ship of losers has finally lost it, they receive no assistance and struggle to protect frontier worlds and battle a clearly superior force. The sci-fi elements include a full array of interstellar FTL capability with some high powered weaponry. The aliens are never actually seen, but hint at biological or organic engineering for their craft along with worm-like tendencies down a gravity well. The appeal of the tale is a captain, crew, and ship that most have given up on, but continue to go above and beyond with unique and creative solutions to novel and never before encountered scenarios. The narration is well executed; Mark Boyett appears specifically designed for sci-fi military stories. Pace, tone, and mood are well coordinated with the story flow. Although the theme is well worn, this offering is a cut above in terms of quality and satisfaction. I have had the pleasure of listening to many excellent audiobooks, but it was Mark Boyett's performance that woke me up to the art of narration. No missteps in transition from character to character and each of his characters voices rang true. I don't believe that up to this point I have listed to a book where I have not been distracted from time to time by an out of character voice. Loved the book and the performance! Where oh where is book 3? First off, if you're like me and can't stand even the best of stories if the narration isn't good, this is a safe bet. Mark Boyett is very good, giving each character a distinguished and fitting voice that makes it easy to tell who is talking, without being distracting. The book is your standard space combat archetype, but in the best possible ways. Dalzell crafts a believable world a bit more grounded and approachable than something like Star Trek. FTL comes with rules, costs and tradeoffs. Combat between ships takes place at speed, with logical weapons one could imagine being real some day. Additionally, the writer does well to describe the visuals of these ships instead of leaving you with nothing to go on. As with most books of this type, its weakness is in the fleshy human stuff. Nothing cringe worthy or distracting, just less BSG style intrigue, complexity and depth than I'd have liked. Overall, fully worth the read if you enjoyed Old Man's War, The Lost Fleet and the like. Don't waste a credit. Get the Expanse series. Would you try another book from Joshua Dalzelle and/or Mark Boyett? Not by Joshua Dalzelle. Boyett was a good reader. What was most disappointing about Joshua Dalzelle’s story? It was stupid and derivative. Drunken disrespected captain meets unexpected aliens and overcomes impossible odds was already done by Ark Royale among others and that was not stellar either. The bureaucratic superiors persisted in making stupid self serving choices in the face of enemies that destroyed entire planets. It was beyond plausibility. The reader did a good job of having different voices for different characters that were appropriate to the characters. Too bad he didn't have more to work with. great narration. he is always good. the technology could have been better for being 400 years in the future. If you could sum up Warship in three words, what would they be? Wel honed characters, good build up to the plot, exciting rollacoaster to the last page. Have you listened to any of Mark Boyett’s other performances? How does this one compare? Another Mark Boyett master-class! - how does he do it (I imagine it's a hell of a lot of work). Extremely well written, very nicely paced, intelligent treatment of the 'first contact' scenario in the 2400. I am a classic SF and hard SF fan and I loved this book - I only hope that Joshua is working hard on the second of the series. Finally a good space adventure book! Yes I would recommend this audiobook to friends and family. The storyline was well written from start to finish. The characters were well defined in both the author writing of them and the narrators portrayal, that it really brought this story to life. What other book might you compare Warship to, and why? Which character – as performed by Mark Boyett – was your favourite? There was no favourite character that was performed by Mark Boyett because I like them all. It shows how great the narrator is when each character is defined by their different pitch and accents to a degree that you forget that all those voices are spoken by one person! I hope Audiobooks decides to make the other books into audio. It be a shame to just leave it at Warship! The fact I liked this book so much I bought the next book but in kindle format. But, it's a good thing. I was caught up in the enjoyment of the world that Joshua created, and I can't tell you how that felt after listening to a few books that didn't quite hit the mark. I really enjoyed Mark as a narrator, he's defo in my league of go to narrators now. (especially if Sci Fi is his genre) he had great tone and impressions for both male and female characters. Each was unique enough that I didn't need the tags to know who was talking and that says it all to me. Wolf was a great Captain to follow into the belly of the beast, just when you think he's done the worst thing ever, it proved to be the right thing and he pulled most of the men on his crew out the crap. I was thoroughly hooked, and no sooner had this one finished, I was onto the next. Kudos to both narrator and writer, it was a very flawless book and series. Thank you so much for the entertainment, and thanks to my friends who sent me your way. An Excellent story with good characters, plot and a new take on old issues. Mark Boyett's performance is great and perfectly blends into the story. I can't wait for book 2. How to Have Fun in Space! This was just what the doctor ordered! A good, old fashioned sci-fi romp which was refreshingly clear of trying to be super-original, dystopian, cyberpunk or too deep and meaningful. Just a captain and his destroyer trying to keep his crew alive and beat the nasties. This is simply a roller-coaster ride of a story which happens to be within the sci-fi genre. It’s like Jack Reacher in charge of several thousand tons of military hardware out in space with slightly less predictable opposition! I loved the idea of a human race drifting into almost total complacency after hundreds of years without any wars being given an incredible alarm call. 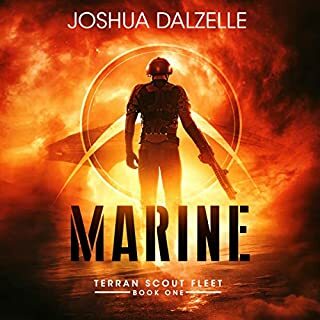 If you’re after the kind of book where you just want a good sci-fi military action thriller and even when at the end it does pull off a quite ridiculous twist you want to stand up and salute the Star Fleet flag anyway then this is the book for you. Mark Boyett’s excellent narration will take you on quite a journey. If you’re searching for a latter day Heinlein or someone to rival William Gibson for provoking the grey matter then your cyber-enhanced prosthetic nostrils have not served you well in leading you here. Excellent start to a good fun series with plenty of clever action, excitement and decent characters. I’ll be back for the rest of this one at some stage, make no mistake! hooked so I purchased this title and was so glad I did! needed to understand and provide a consistent backbone to the plot. incorporated perfectly into his vision of the future. same time as it is often too easy to write almost perfect lead characters. that Jackson Wolf does exactly the things that I might do in his situation. this was indeed the path the characters went. stories that sets them apart from others. this is an excellent book. Not too heavy and very accessible. Really enjoyed a good romp through space. Nicely paced, good action. Looking forward to more. I loved every minute. Looking forward to the next in the trilogy. Call to Arms. Thank you. Very much a book for true scifi fans. Characters real not too over made. I look forward to the rest of the series. clean writing style to the point not overly verbose I'm waiting for the next one. 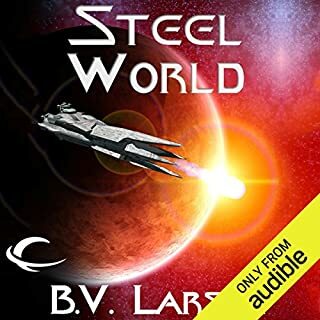 I've listened to a few different audible space opera Sci-Fi books and this one is certainly up there! A great story with some great characters! The writer doesn't bore you with too many details and keeps the story moving. Looking forward to seeing the characters develop further in the second book! I wasn't sure about this book before I started but it proved to be one of the best sifi books I've read. It's not a grand space opera but it's perfect for what it is - a damn great story. I liked the captain, he was relatable and very human. I'm about to get the next book in the series, I can't wait. Trust me here I'm currently sitting on a total listening time of 6 months, I've read the good with the ordinary and I really enjoyed this book. Give it a chance, strap yourself in for a wild ride. it was a great book. i will be reading all in the black fleet series. Make sure you check out the expansion wars trilogy also. It's never over till . . . .
it was nice to see the story wrap up at the end of the book but with a good lead into the second book. just enough detail with out being repetitive looking forward to book 2. Well crafted story, that isn't too technical as to make it unapproachable, but contains enough detail and background as to give you a complete understanding of the characters and sittings they face. Recommend.